Marco Island, Fla. — Audrey Copeland, Ph.D., P.E., is the new President & CEO of the National Asphalt Pavement Association (NAPA). She took the association’s helm on Jan. 22 during a ceremony at the NAPA’s 64th Annual Meeting. Copeland was named to succeed Mike Acott, who served as NAPA’s President since 1992, in September 2018 and has served as NAPA’s Chief Operating Officer since then, working with Acott to ensure an orderly transition. 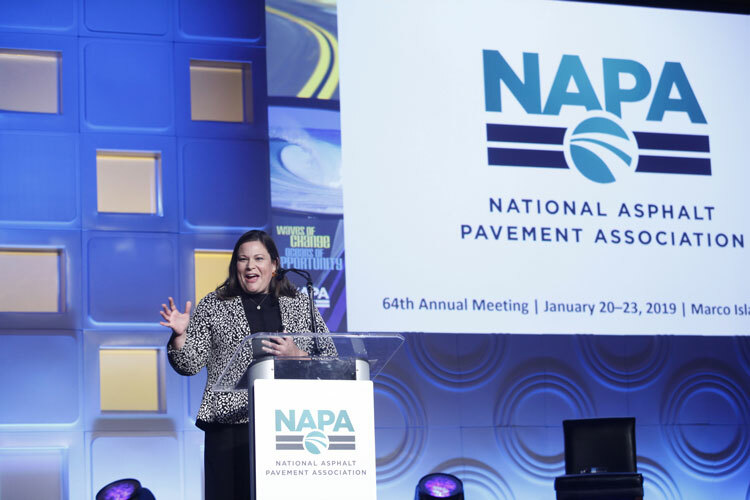 In her address to NAPA members, Copeland pledged to continue NAPA’s tradition of working to safeguard the asphalt industry, strengthen alliances and collaborations, and modernize the way the industry and the association do business. Copeland joined NAPA in 2012 as Vice President for Engineering, Research, and Technology. In that role, she has grown NAPA’s engineering team and forged strong relationships with the State Asphalt Pavement Associations, Asphalt Pavement Alliance, National Center for Asphalt Technology at Auburn University, the Asphalt Institute, Federal Highway Administration, and other industry professionals and partners. She also served as technical lead for more than $2 million in industry-funded research projects and secured a cooperative agreement with the Federal Highway Administration that has invested more than $2 million in government funding to advance asphalt technologies. Prior to NAPA, Copeland served as a highway and materials research engineer with FHWA. She earned her doctorate in Civil Engineering from Vanderbilt University, and holds master’s and bachelor’s degrees in Civil & Environmental Engineering from Tennessee Technological University. She is a licensed Professional Engineer in Maryland and Virginia.